These top quality caps are navy blue and come with your choice of embroidered design on the frontfeaturing a colorful embroidered FIGHTING BEE. 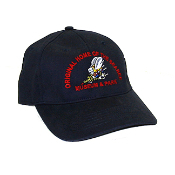 Choose from these Seabee Museum exclusive embroidered caps: ORIGINAL HOME OF THE SEABEES, ONCE A SEABEE ALWAYS A SEABEE, or RETIRED SEABEE. Don't see what you want? Be sure to check our PATCH caps.